Rum Chata tastes like liquid Cinnamon Toast Crunch cereal. I had my first shot of it last summer and when I saw THIS PIN on Pinterest, I decided I had to try to make my own cupcake. 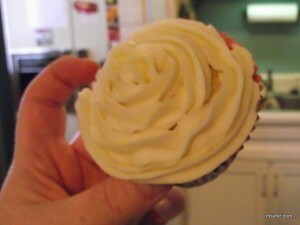 The recipe link is a Rum Chata cupcake from scratch with a cream cheese frosting. I prefer boxed, so I improvised and it turned out perfect. Preheat the oven for 350 degrees. Mix the cake mix, water, rum and oil together. 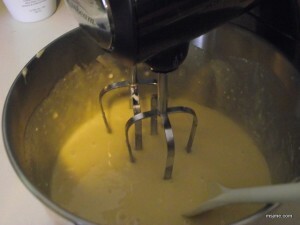 Beat the eggs in a separate bowl then add to the batter and mix thoroughly for 1 minute. Pour into cupcake liners and bake for 18-20 minutes. The cupcakes will be light brown on top and the toothpick will come out clean. These cupcakes are for ADULTS ONLY since they do have alcohol as an ingredient. This recipe makes 24 regular sized cupcakes-that are super moist. 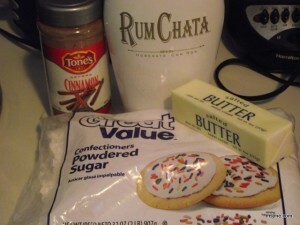 If you don’t have the Pillsbury Traditional Vanilla Cake mix, just substitute 75%ish of the water listed on the box mix recipe for Rum Chata. In other words, if the recipe calls for 1 1/4 cups water, do 1 cup Rum Chata and 1/4 water. 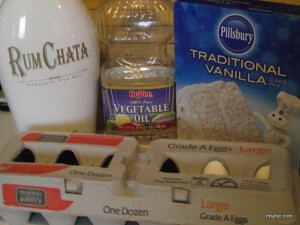 If it calls for 1 cup water, then put 3/4 cup Rum Chata and 1/4 cup water. Hope that isn’t too confusing….oops!